Epifluorescence microscopy of microtentacles forming on the surface of a breast tumor cell in a free-floating microenvironment. Microtentacles may play a role in tumor metastasis by helping cancer cells attach to blood vessel walls in distant parts of the body. 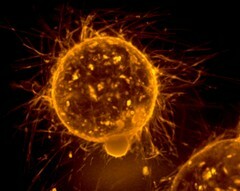 New therapies that inhibit microtentacles could help reduce metastasis. Since microtentacles respond rapidly to drug treatments, drugs could be quickly tested for individual patients to improve precision medicine.